OBAMA’S CHINA LEGACY: WAR OR PEACE? Obama entered office on a peace platform, advocating a draw down on troops in the Middle East and winning the Nobel Peace Prize. Later actions emphasized this same message, such as his efforts to reopen ties with Cuba. Recent regional tension, accusatory rhetoric, and warnings of future conflict between China and the U.S., however, calls into question whether Obama’s legacy in the Asia Pacific has actually steered the region further from peace and closer towards conflict. As Monday marked the end of the G20 conference, and what was likely President Obama’s last trip to China during his tenure as president, it is impossible not to look back at his relationship with China and its leaders over the past eight years. Some aspects of Obama’s most recent trip could have easily been taken from the news clippings of previous years. Questions of freedom of the press quickly arose and media outlets questioned if China was using its role as host to “flex its muscles” over the U.S. Overall, however, the tone of Obama’s arrival and subsequent meetings more noticeably showed the increasing tension between the two powers than had been publically visible in previous meetings, such as the deliberately casual Sunnylands “shirt-sleeve summit” (California, 2013), or the successful APEC climate change talks (2014). Of course, there were areas of clear agreement between the leaders. In regards to climate change, for example, tangible achievements were reached during the G20, with the countries formally ratifying the 2015 Paris Agreement. In fact, climate change is a prime example of an issue area where China and the U.S. have consistently pushed aside their differences in order to work together and move forward in addressing an overarching global concern. Such areas of agreement, however, seem increasingly rare as we look at the overall regional climate with its increased tension in the South China Sea. The Hague tribunal ruling in favor of the Philippines has increased the stakes and both the U.S. and China have made statements calling for the other country to change their actions in the region. Heightened concerns over China (and Russia) have even led Obama to abandon his previous peace oriented proposal to declare the U.S. a no-first-use nuclear country (article), even though China has been a no-first-use country since its first nuclear test. This tension is not new. It has been building throughout the Obama administration and can be traced back to two key events: Obama’s Pivot to Asia and Xi Jinping’s rise to power and subsequent efforts to project a stronger China. The U.S. decided to refocus its attention on the Asia Pacific region at exactly the time China was preparing to declare its strength as a world power. What had been seen as a necessary stabilizing influence by the U.S. in the post WWII era was now viewed as a challenge to China’s own rising influence in the region. This conflicting dynamic was only worsened by the level of mistrust and misunderstanding between the two sides and exposed how delicate and tenuous the U.S.-China relationship truly is. The modern U.S.-China relationship was born not out of shared values or world views, but out of pure strategic necessity during the Cold War era. When the Cold War was finished, the relationship was then sustained by China’s reliance on the U.S. dominated system to ensure its own economic development, growing economic globalization, and, notably, the recognition by U.S. leaders that China was too big a country to ignore. 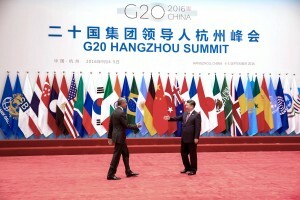 These types of relationships are especially vital when dealing with countries like China, with its top-down authoritarian leadership and the emphasis placed on personal relationships and “guanxi.” This is only more important when looking at China’s president Xi Jinping, arguably the most influential individual leader China has had in recent years. A generation of American leaders, starting with Henry Kissinger and Richard Nixon and continuing on to include President Carter, President George H.W. Bush, and a large array of well-versed China advisors, cultivated personal relationships with China’s leadership that continued long after they left office. Even as removed as Kissinger is from official political life today, he is still considered a respected leader in China and a valuable and trusted source of advice and Track II diplomacy. That same level of closeness cannot be ascribed to anyone in the Obama administration. While the large numbers of high level contacts between the U.S. and China established under the Obama administration comprise a vital element of improving mutual understanding and strengthening the bilateral relationship, the tone and quality of those interactions are just as important. Of course, in today’s global environment a relationship like the one that existed between Nixon and Mao cannot, and should not, be replicated today. This is not a Cold War scenario with a single shared external threat; there are real areas of disagreement that have to be addressed. With those differences adding challenges and complexities to the bilateral relationship it is actually more important than ever that the next U.S. administration make it a priority to appoint officials who have the background, knowledge, and wherewithal to build ties with Chinese leaders that will create the backbone of a new U.S.-China relationship. As past American presidents have come to realize, China is not going anywhere. It is also important to note that, despite its size, China does not have a history of continually seeking to conquer foreign countries and is currently largely focused on its many domestic concerns. With these factors in mind, I hope that the final days of Obama’s presidency will be filled with the same messages of hope, peace, and global cooperation that were displayed during its earliest days. Chi Wang is author of several books on U.S.-China relations, including Obama’s Challenge to China: The Pivot to Asia (2015), and The United States and China Since World War II: A Brief History (2013). He has also taught Chinese history and U.S.-China diplomacy at Georgetown University since 1969. This article was also published on Huffington Post, here.